This has been a great CES. We've seen some fantastic products (if nothing truly, truly mindblowing) while reports of lower attendances because of the economic climate weren't reflected on the show floor. Getting around the major booths was a something of a mission; the place was absolutely packed on the first two days of the show. 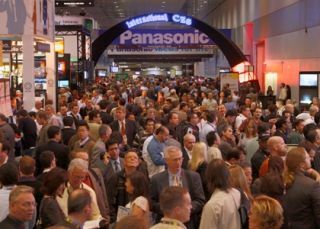 Many of those in the industry that we've spoken with feel they've had an extremely successful show with one declaring that there was a buzz about this CES that he hadn't experienced for a while. On the show floor there was a real noise about two TVs in particular – Samsung's super-cool LED 9000 series and Toshiba's forthcoming Cell TV, which has so much high technology inside it that it's difficult to believe it will actually be on sale (albeit for a whole lot of money). There's a real feeling that Samsung has really nailed it this year with its line-up and the TVs are nothing short of stunning. Sony didn't amaze (though we do like the look of the Bravia LX900) but it's moving in the right direction – finally truly embracing non-proprietary technologies in many products (like SD, for example) and bringing out properly interesting products like the Dash internet viewer. As we said in our piece about the movers and shakers at CES, any overriding theme has to be 3D, even if we're unsure as to how quick any take-up will be. Also buzzing around the show were a whole bunch of Linux and Android-based netbooks with non-Intel processors. This show really proved just how many manufacturers are deadly serious about providing an alternative to the old Wintel philosophy and with manufacturers such as HP and Lenovo publicly demonstrate their support for non-Windows based netbooks. Microsoft has been a bit of a loser at this show and the general feeling is that the Ballmer keynote was the biggest disappointment seen at CES for a long while, managing to turn the good news around Windows 7 sales into something lukewarm and fizz-free. We're getting a bit fed up with keynotes from the likes of Microsoft and Intel that include precious little substance and instead preach Bill Gates' old "we'll have many devices and they'll all be integrated" mantra. Get over it. Intel won't be quaking in its boots as a result of the efforts of others, but the buzz at CES hasn't been about Core i5 and i3 or Atom (though its new Atom processors are far improved). Instead, people have been talking about those producing other silicon. Qualcomm has had a superb show with Snapdragon devices debuting all over the place, while it's not been too shabby for Nvidia either – some of the stuff that will be powered by Tegra 2 will amaze. The green team are definitely worth watching during 2010. 3D Vision is still a bit of a gimmick, but the industry seems to feel that 3D gaming will go mass-market and Nvidia's partnerships with several laptop manufacturers and more monitor manufacturers shows that companies are happy to put their weight behind the concept. From being a gimmick this time last year, 3D is now here to stay.